Seeing the Rocky Mountains – The Singin1 on the Road! After prepping RB for the journey, we set off from Denver. Intrigued by what I read about the Rocky Mountain National Park, we made the first of what I suspect will be several changes in routes on this excursion. Boy, was it worth it!! Started raining as we left Denver, but it was a clear and beautiful afternoon by the time we reached the park entrance. Momma purchased a senior pass, which gives her (and her guests) access to the park system for life. In addition to having lunch up there, we made many stops to take pictures and just to enjoy God’s creation. A co-worker at the college had recommended I drive using low gear. That really helped with the braking around some serious hairpin turns. When we reached the highest point of the route, the temps got quite rather chilly, and we actually had to stop a one point when a hailstorm started. Got pretty up-close to a wild animal that seemed to be quite used to contact with humans from the way it ran amongst us. Wild animals could be seen regularly at various stops. A chipmunk or two were captured in pictures. At the end of the park route, the GPS took us through some pretty lonesome roadways where setting the cruise control kept me from yielding to the temptation of giving RB her head. 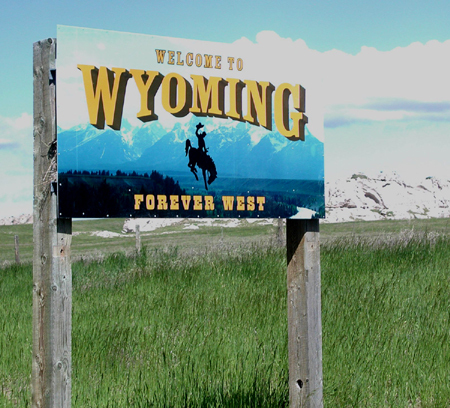 Finally crossed into Wyoming (the time on some of the pictures are Eastern Time, btw) and stopped for the night.